This topic describes how to retrieve app, task, and service instance usage information using Apps Manager. You can also retrieve app, task, and service instance usage information using the Usage service API, or the Cloud Foundry API from the Cloud Foundry Command Line Interface (cf CLI). For more information, see the Monitoring App, Task, and Service Instance Usage topic. There are two ways to monitor app, task, and service instance usage from Apps Manager. The Accounting Report provides a summarized report, and the Usage Report provides a more detailed view of the data. The Accounting Report displays instance usage information for all orgs in your Pivotal Cloud Foundry (PCF) deployment except the system org. 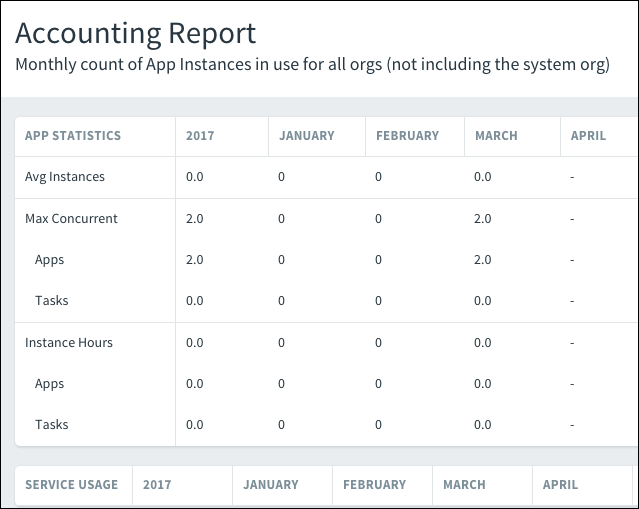 The Accounting Report provides a high-level overview of your usage by displaying your monthly count of app, task, and service instances. Follow the steps below to access the Accounting Report. Log into the Apps Manager as an admin. From the left navigation of Apps Manager, select Accounting Report. Under App Statistics and Service Usage, view the average and maximum instances in use per month. Max Concurrent displays the largest number of instances in use at a time over the indicated time period. The Accounting Report calculates these values from the start, stop, and scale app usage events in Cloud Controller. The Usage Report provides a more granular view of your usage by detailing app, task, and service instance usage information for all spaces in a particular org, excluding the system org. Follow the steps below to access the Usage Report. Log into the Apps Manager as an admin, or as an account with the Org Manager or Org Auditor role. For more information about managing roles, see the Managing User Accounts and Permissions Using the Apps Manager topic. From the dropdown on the left, select the org for which you want to view a usage report. Click Usage Report in the upper right. The top of the Usage Report displays total App + Task Instance Hours, App + Task Memory, and Service Instance Hours by all spaces in the org. The report provides total usage information for each of your spaces. To display more detailed information about app, task, and service instance usage in a space, click the name of the space for an expanded view.